How can I find the input that is causing such long response times? Why would the same parameterized query end up with different query plans? Where can I learn more about that? right-click the graphical execution plan that appears at the bottom and choose "Properties"
Here I'm looking at the compiled values that led to the "green" plan. Clicking on the "orange" plan will show the compiled values for that one. 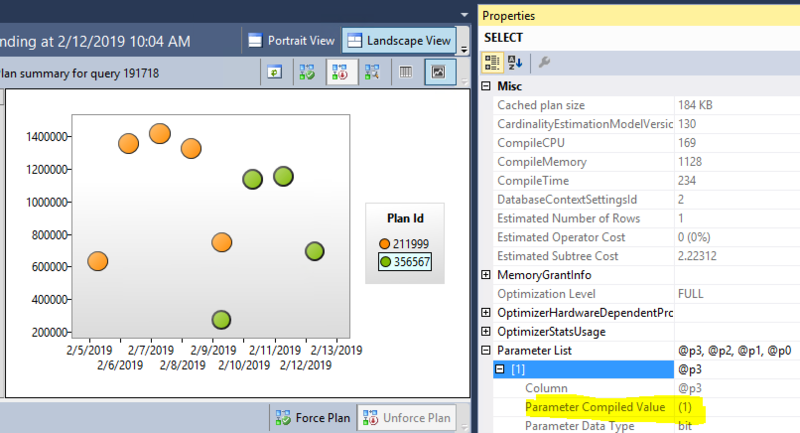 If you prefer not to use the user interface, you can get the plans directly from the Query Store tables using the method described by Max Vernon here: Does SQL Server Query Store capture parameter values? And plans can change for a variety of reasons, such as a significant data change that invalidates statistics. Some other relevant info here and here. A new plan can get compiled for a number of different reasons (including statistics updates, manual plan clearing, adding up or rebuilding indexes, etc). which is the process for which SQL Server chooses different plans depending on the parameters values? I would like to read more about that. Why is my query suddenly slower than it was yesterday? There are some very comprehensive discussions about the topic of parameter sniffing in the "learn more" links at the bottom of that answer. Not the answer you're looking for? Browse other questions tagged sql-server sql-server-2016 execution-plan query-store parameter-sniffing or ask your own question. 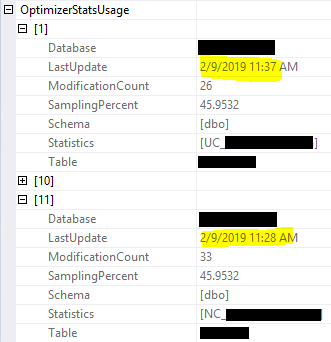 Does SQL Server Query Store capture parameter values? How to get information about query plans that are out of cache? How to search Query Store for queries with multiple plans?